Estonian native horse belongs to the north forest-horse group and it is one of the few breeds, which has retained the characteristic features of the native northern horse and were not significantly influenced by crossing with other breeds. The oldest records about Estonian native horse are dated from 11th century. In 12th-13th century mainly merchants of Novgorod exported the Estonian native horses. In the 13th century was Estonian native horse used as warhorse, especially in the battles in Swedish age, Peter I ranked it very high and many horses were brought to Russia. The Estonian native horse was the only horse breed used by farmers in Estonian and Livonian province until 18th century. It was famous all over the Russia because it’s big propulsion, endurance and modesty. Purposeful breeding of Estonian native horse began in 1921, when in Haapsalu was grounded the studbook. By breeding the Estonian native horse is used mainly the pure breeding. To raise the propulsion, weight and height in 1921 – 1938 were exported 13 Finnish native stallions. The salient strain founders were Vuhti 136E, Taru 149E and Lari 23E. From the local aborigine stallions are still used the Ahti 228E, Raspel 70E, Taube 60E and Eni 8E strains. The Estonian native horse is of type pacer. It is not large in size with low legs, long body and dry constitution light farming horse. Head is well proportional, with wide forehead, mostly straight, rarely concave profile, short ears, and frisky eye, brawny chap and wide gap between mandibles. Neck is relatively short side or medium in length, muscular and with dense crest. Withers is low-lying, muscular and with medium length. Back is wide and straight, seldom soft; loin is short wide and strong. Croup is muscular, plump, with medium length and width; tail is placed low and is thick. Thorax is wide and deep, costal good curved, stomach capacious. The legs are short, properly set and distinguished by firmness and cleanness with strong tendons and joints. The hoofs are regular and with hard, leaden coronet. The character of Estonian native horse is live but peaceful, cheerful and sensible, temperament vigorous. The character of Estonian native horse is especially attractive due to the demanding character of ride-horses and disinterest of heavy-draught horses. The Estonian native horse is well adapted to the local feeding and tenure circumstances and is unique by its modesty, good feed use and endurance. The most important ability of Estonian native horse is to live without concentrated fodder and that it does not need a proper stable for living in the snow less period. 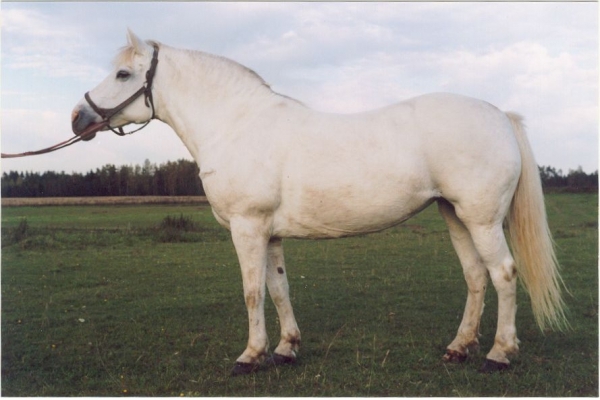 The color of Estonian native horse is very various: 25,8% sorrel, 15,3% chestnut and red, 11,1% black, 20,5% gray, 10,0% yellow, 11,6% cream-colored, 5,3% mousy and 0,5% albino. Aborigine tokens are the dark line on back and croup. The average measurement (in cm) are: stallions - height at withers 142, oblique body length 147, chest girth 178, cannon bone girth 19.5; mares: 141, 149, 182 and 19 respectively. Estonian native horse is known by its relatively great strength and speed. Nowadays is the Estonian native horse universal little horse, which is used for light agricultural work, as a saddle horse for children and in tourism. It represents good breeding material for the production of ponies in various crosses.